A murder suspect led officers on a high-speed chase through Phoenix Wednesday, sometimes going against traffic, until an undercover officer rammed the vehicle. The suspect died at the scene. Police have confirmed that this suspect is connected to a homicide in Ahwatukee early Wednesday morning. Arizona Department of Public Safety officers began pursuing the suspect earlier in the afternoon, after the suspect reportedly stole a white pickup truck. 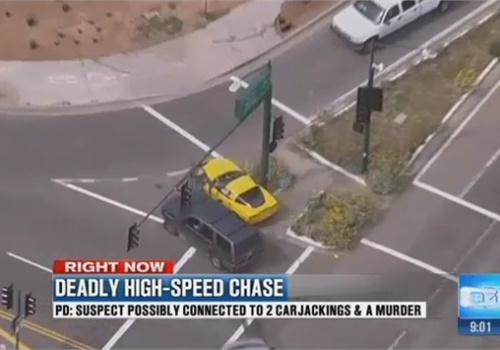 The suspect then later reportedly stole a yellow Corvette at gunpoint, reports azfamily.com. Officers located and pursued the suspect, who was reportedly going more than 100 miles an hour at some points. "Police did intervene and stopped the subject's movement," said Phoenix police Sgt. Alan Pfohl. "Shots were fired and the subject was pronounced dead here at the scene." Phoenix police are calling it an "officer-involved shooting." It is not yet clear if the suspect died from a self-inflicted wound or not. "We know that two officers from our special assignments unit both fired their weapons," said Pfohl. "One is a 50-year-old officer with 29 1/2 years of service in the department. The other is a 45-year-old with 8 1/2 years of service in the department.